To Do (continued) One of our most romantic nights in Oahu was spent out on the water, when we reserved two spots on a catamaran sunset cruise with Hawaii Nautical. I just love being out on the water and knew this would be the perfect date-night activity for the two of us — it did not disappoint! The boat was docked at the Hilton Hawaiian Village marina, so we strolled along Waikiki Beach there & back, hand-in-hand. After removing our shoes as requested, I was pleased to see that the vessel was super clean and there was plenty of space to move around. It felt like they could’ve certainly sold more tickets if they wanted to, but the cruise that evening wasn’t crowded at all…you could’ve easily forgotten that one was sharing the charter with fellow passengers. 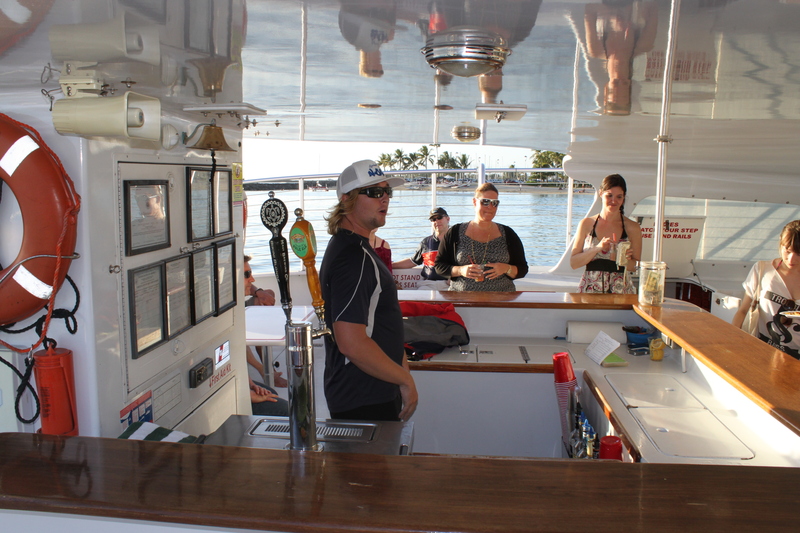 The crew was young but cool & easy going — the “Captain” reminded me of a young Captain Ron. Our tickets included two drinks and light snack-buffet, which turned out to be more than enough food to cover our dinner that day. 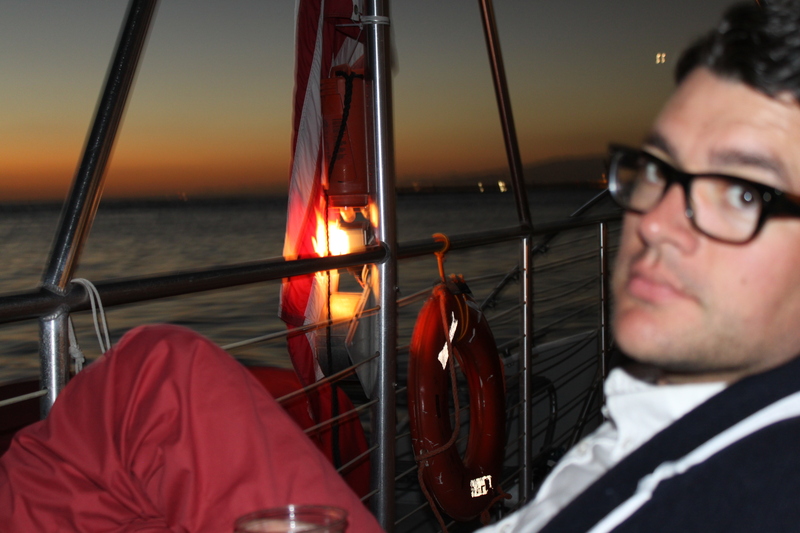 The best surprise: just was the sun was setting on the horizon, our skipper spotted a couple of humpback whales! We had the chance to glimpse one of them tail slapping and the other blowing spouts in the air. The captain said they were likely mating…oh yeeeeah, get it on, humpbacks! 😉 They are an endangered species and migrate to Hawaii’s warm waters every winter to mate & give birth, so it was a special sighting. All in all, the cruise was a low-key & relaxed evening, complete with an amazing sunset over the ocean, strong Hawaiian cocktails, whale-watching, and romance. 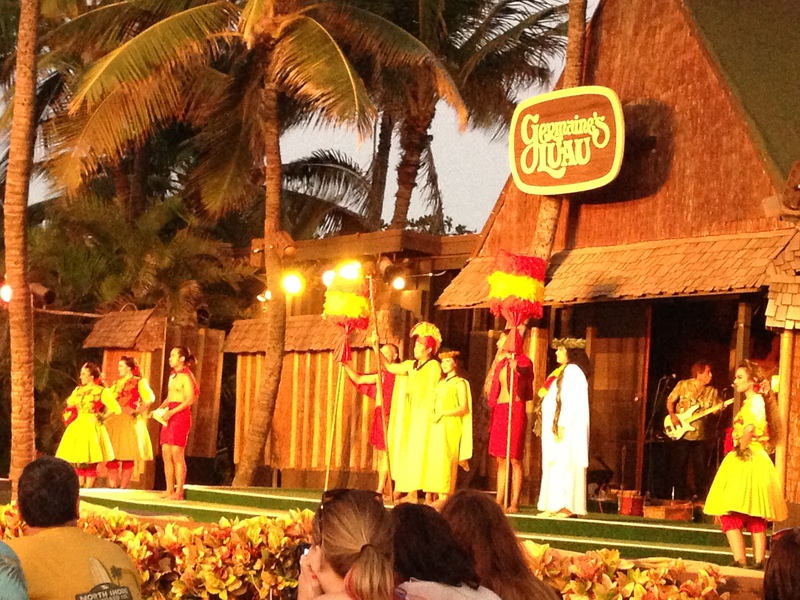 No first-time visitor to Hawaii can leave without attending a genuine Hawaiian luau, right? After doing tons of web research and not being able to make a decision, I went with my local cousin’s recommendation: Germaine’s Luau. Their location at Kapolei Beach was a bit of a trek from our hotel, but that aspect was also part of the charm. 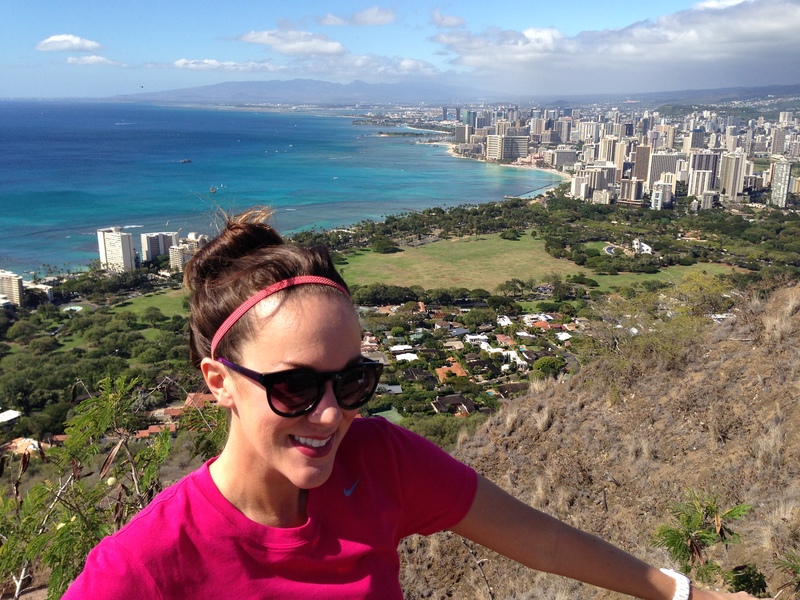 Getting off the beaten path was a welcomed diversion from the alluring hustle & bustle of the Waikiki Strip. The production is a delightfully cheesy and completely family-friendly, but also educational, historical, and encouraged audience participation. The show covers ALL forms of hula dancing in a full-scale Polynesian Review…you’ll see fire dancing, glitzy costumes, Tahitian dancing, Samoan slap-dancing, live Bora Bora drums…everything! 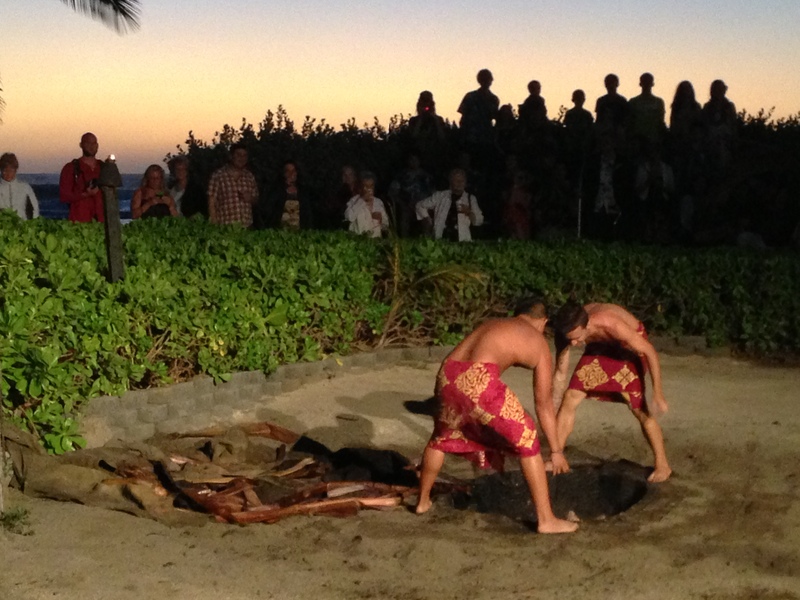 Despite being touristy, I would say this luau is the one to go with just for the authentic Kalua Pua’a (roasted pig) and the ceremony that goes along with unearthing it from the imu (underground oven). 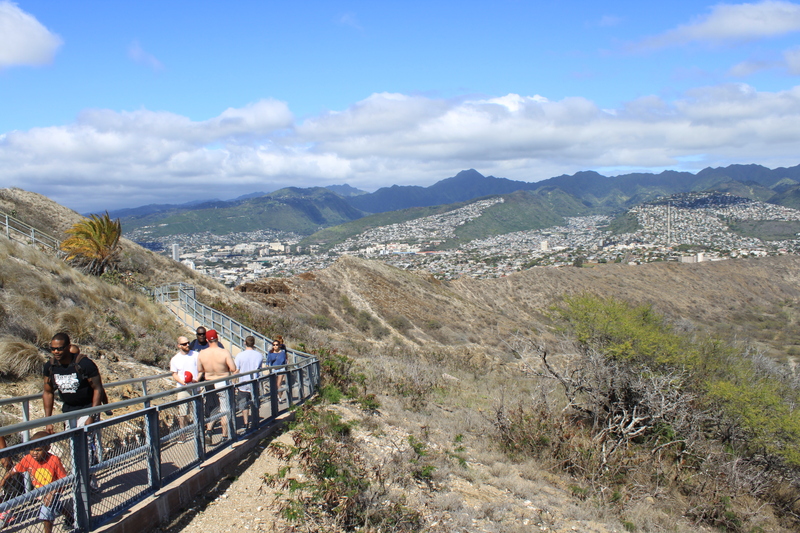 Another must-do Oahu excursion is hiking to the top of Diamond Head. Keep in mind: the trail gets crowded, bring a bottle of water and wear closed toe athletic shoes. We did the .8 mi trail at a brisk pace without stopping so I found myself working up a little sweat…I would say getting up there is a moderate but invigorating workout. Although the official web site describes the hike from trailhead to summit “steep and strenuous, gaining 560 feet as it ascends from the crater floor” I believe ANYONE can do this hike. The measly $1 per person admission and upward climb is SO worth it for the panoramic postcard views from the top! 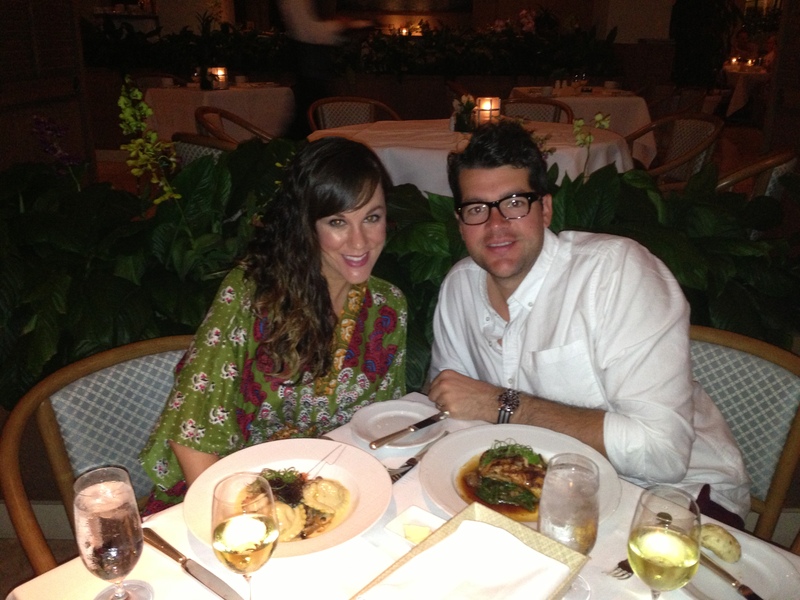 Anyway, our best meal of the trip was at the Halekulani hotel. We couldn’t get a reservation at their flagship restaurant, La Mer, so we opted for an oceanfront dinner on the terrace at Orchids. It was such a beautiful night, zero humidity, warm but with an ocean breeze, stellar service, and an atmosphere awash with live orchids, one of my favorite flowers. After sharing the Ahi Crudo appetizer, Ryan ordered the Togarashi Spiced Opah, while I chose the Kahuku Shrimp Ravioli. The food was so good and atmosphere so comfortably upscale, that we decided to return to the Halekulani for our farewell dinner. This time, we were enticed by the sound pouring from their outdoor restaurant, House Without A Key. With live Hawaiian music performed under a century-old Kiawe tree, sitting next to my husband with a glass of wine, drinking in the Hawaiian sunset, and former Miss Hawaii dancing hula…our last night on Oahu –much like the entire vacation– was nothing short of magical.